What subjects do you teach ? We help students primarily in the areas of reading, writing, spelling, comprehension, English and maths – from Primary to Secondary. We also offer tuition to help prepare your child for exams such as Junior Certificate in English and Maths. What ages do you teach ? The majority of students we teach are aged from 6 to a limit of 16 years old. Do you help prepare students for exams? We do exam preparation for the secondary school entrance tests, end of year exams and Junior Certificate Maths and English. It is important that you contact us well before the exams to give your child the best chance of success. How do I know that my child will improve ? Your child will improve if they are supported at school, home and at Kip McGrath. Every child that attends tutoring regularly each week and does all of their set homework will improve – both academically and in self confidence. How long will it take to solve my child's problem ? Every child is different and every problem is different. After the initial assessment, we will be able to provide an indication of how long tutoring may be required and your child’s progress is monitored regularly by continuous assessment. We will also provide regular parental feedback. There is no obligation or contract to attend for any period of time. If, for whatever reason (e.g. change of financial circumstances), you decide you are no longer able to attend, all we ask is two weeks notice. Can you tutor my child with a specific learning difficulty ? There are many specific learning difficulties with varying levels of disorder. We do have a large number of students attend our lessons with difficulties such as ADHD, Asperger Syndrome and Autism, Dyslexia, Dyspraxia, Speech & Language difficulties and others. Our main focus is to ensure that your child is able to progress within the curriculum and maximise their academic potential. Will you come to my house to tutor ? All tutoring is done within our centre. This enables us to provide the best facilities and teaching resources to meet the needs of your child. How does the initial assessment work ? Many parents are concerned about how their children are performing at school and whether their children are at the appropriate level for their age and class. We provide a free, no obligation assessment and discuss the results with you in detail to determine exactly how your child is performing. How long is each lesson ? Lessons are 80 minutes long and students usually attend for one lesson a week. Some children do attend more often, according to their needs. Even young children attend for 80 minutes – their lessons are broken up into short activities, designed to keep them keen and interested. What times are the lessons held ? There are a variety of lesson times available after school from Monday to Thursday and Saturday morning. Will my child get homework ? Homework is an essential part of the Kip McGrath programme. We are aware of each student’s school workload so set homework is generally limited to around half an hour each week. There is no parental involvement in homework as our experienced, qualified teachers use it to check retention and identify ongoing difficulties. 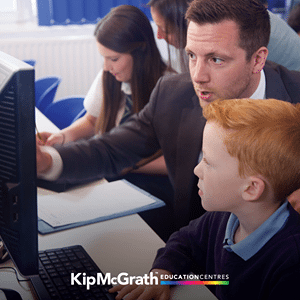 How should I help my child while at Kip McGrath ? Make sure that they attend their tutoring sessions each week and complete the homework task – regularity is a major key to improving your child’s results. Please fill in your details and we will get back to you as soon as possible with more information and the opportunity to book a free assessment. What class is your child currently in? What does your child need help with? © 2018 KipMcGrath. All Rights Reserved.